Located on Via Vittorio Veneto near Piazza Barberini in Rome, the Capuchin Crypt lies beneath the fairly nondescript Church of Santa Maria della Concezione. Inside the Museum and Crypt of the Capuchin Friars (Museo e Cripta dei Frati Cappuccini) you'll find several small rooms adorned from floor to ceiling with the intact and dismembered skeletons of approximately 4,000 monks who died between 1528 and 1870. Though the premise seems eerie and macabre, it is also a surprisingly beautiful and peaceful experience in the Eternal City. In the middle of the 17th century, the Capuchin friary of Rome's St. Bonaventure was moved to Santa Maria della Concezione. The Pope's brother commanded that the friars bring all their belongings to their new digs. This included the bones of their dearly departed compatriots – so they could all spend eternity together in one place. Friar Michael of Bergamo, the first overseer of the newly located ossuary, took to systematically arranging the bones in artful displays. The tradition continued after his death and as new friars died, long-buried corpses were exhumed in order to make room for the newly deceased. The exhumed skeleton parts were then added to the decorative motifs. A visit to the Capuchin Crypt includes the museum of the Capuchin order, which offers an in-depth – and somewhat exhaustive – history of the brothers and their mission work across the world. A highlight of the museum is a painting of Saint Francis in meditation, attributed to none other than Caravaggio. This is a solemn place of worship and reflection, therefore loud talking is not only discouraged, but it's also disrespectful. The crypt is, above all, a religious site. Just like at all of Rome's churches, modest dress is required, meaning no shorts or skirts above the knees, and no bare shoulders on men or women. Hats must be removed. For those who find death upsetting, we recommend skipping the visit. The crypts are not suitable for young children. The intent of the Capuchin Crypt is not to be grotesque (although for some visitors it probably is), but rather to serve as a somber reminder of our short time on this Earth and the nearness of our own mortality. 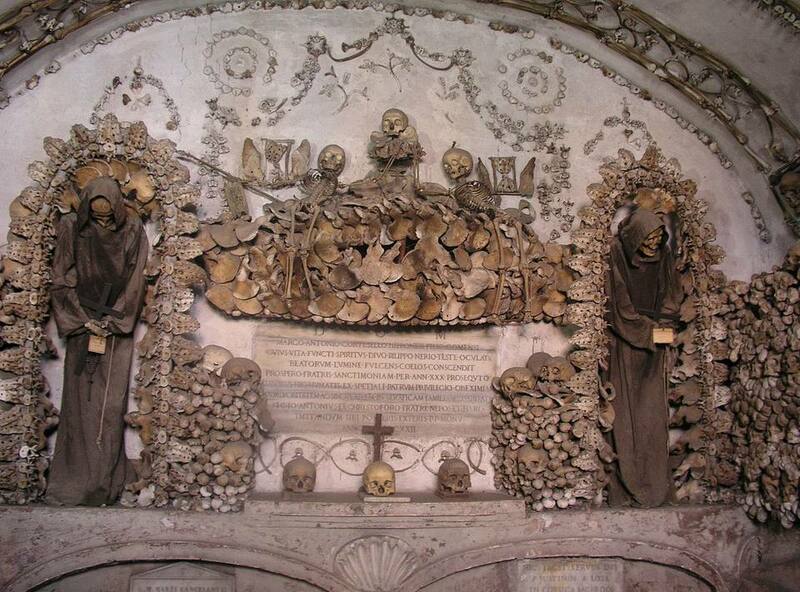 Crypt of the Leg Bones and Thigh Bones: The type of bones that you'll find lining the walls of this room may not be surprising, but the severed, crossed arms that make up the Capuchin's coat of arms might be. Crypt of the Pelvises: Skeletons dressed in their hooded friar's frocks are suspended from the walls and surrounded by butterfly-shaped pelvic bones. Crypt of the Resurrection: This chamber's highlight has to be the painting depicting Jesus raising Lazarus from the dead, framed by — you guessed it — a lot of bones. Crypt of the Skulls: Named for the hundreds, and possibly thousands, of skulls that decorate this space. Crypt of the Three Skeletons: Containing mummified, robed figures amidst thousands of bones, on the ceiling is a small, bony figure holding a scythe in one hand and a scale in the other. A plaque reads, “What you are now we used to be; what we are now you will be.” It's a reminder of the cycle of life, and that we are all quite mortal. The Mass Chapel: Used to celebrate Mass, this is the only place in the crypt without bones. It does, however, contain a relic (the heart of Maria Felice Peretti, the niece of Pope Sixtus V) and the tomb of the Papal Zouaves, defenders of the Church at the battle of Porta Pia. Hours: The Museum and Crypt: Open daily 9:00 a.m. to 7:00 p.m. (last entry 6:30 p.m.). Closed Easter Sunday, December 25 and January 1. Admission: Adults: €8.50; Children under 18 and seniors over 65: €5.00; Audio guides are available in Italian, English, and Spanish. Prices are current as of January 2019. On Foot: The Crypt is approximately a 10-minute walk from the Spanish Steps. Public Transport: Take the Metro Line A to the Barberini station and then walk 2 minutes to the church. Buses: 52, 53, 61, 62, 63, 80, 116 and 175 also stop nearby. Via Vittorio Veneto: This boulevard lined with ritzy hotels and posh restaurants was made famous by Fellini's 1960 film "La Dolce Vita." Though slightly faded from its former glory, it's still a symbol of the decadence of Rome's stylish upper class. Piazza Barberini: A large square just to the south of the entrance to Via Veneto contains the Fontana del Tritone (Triton Fountain) created by master sculptor Gian Lorenzo Bernini. Spanish Steps: An iconic Roman location, it is a great place to people watch. Climb the sloping steps from Piazza di Spagna up to the church of Trinità dei Monti. Trevi Fountain: The largest Baroque fountain in the city, when you toss a coin into its waters, it is said that your return to Rome is assured.